(Please, CLICK to ENLARGE - twice) Horace is here about nine miles downstream (to the west) of the Twin Sisters, which welcome drivers to the Wallula Gap when they approach it from upstream - from the north or northeast. McNary Dam would be about a dozen miles behind Sykes, except that it was not yet been built when Sykes visited this site. The big islands, Van Skinner and Switzler, that once divided the Columbia River are now submerged beneath Lake Wallula, and so would offer no camping for Lewis and Clark. I deduce that it is Switzler that we see in the Sykes view, although it may be Van Skinner. 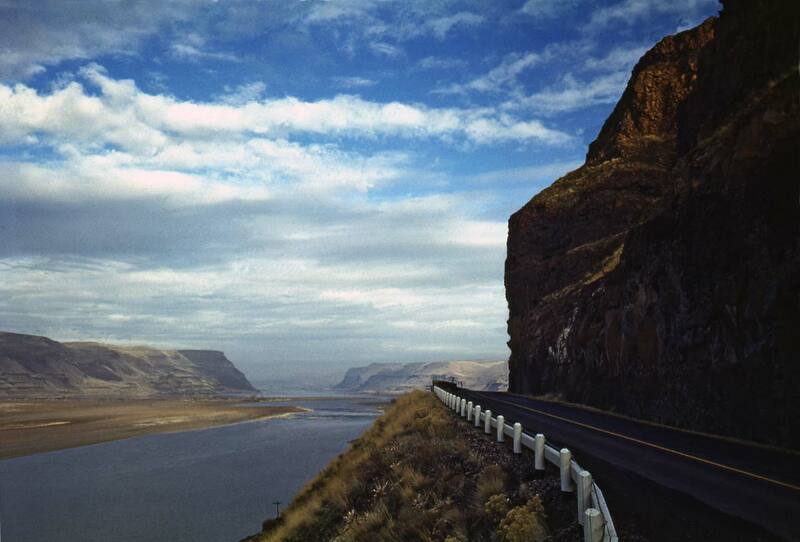 Thanks to the Oregon Department of Highway this exposed location on the Columbia River highway, Oregon side, is well known to drivers for its picturesque effects. It is just the sort of subject Horace Sykes sought and for which he would stop his Chevy. The Twin Sisters were featured with Our Daily Sykes #100, below. Most likely they were photographed on the same trip down the Columbia - or up.